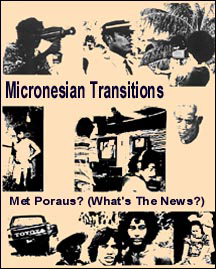 Part of the "Micronesian Transitions" videotape series from 1977 to 1983, this program is a survey of media communications in Moen, Truk (Chuuk), and presents the results of a study of communication modes in business, government, and home sectors. The use of signs, newspapers, radio, and telecommunications as well as future developments are discussed. The results of the study indicated that radio was the most important form of mass media in Truk, but equally important was face-to-face, word-of-mouth communication. Producer: Xavier High School, Truk. Director: Eric Metzgar, Instructor. Senior Town Study Project students: Alfred Aliven, Roland Lomongo, Filomenia Mathias, Immaculata Sewell, Cinder Kom, and Julia William.